Is there an exclusive POP Vinyl community for collectors? Yes, we host a community especially for Funko pop vinyl collectors for members to discuss, meet, trade pop vinyls and offer frequent FREE give aways. Is there is joining fee to join the POP Vinyl forum? No, its completely free for all. I am interested in trading my POP Vinyls with other collectors, is there a way to trade securely with other members. Yes, we offer trading of POP Vinyls and other Funko products on our POP Vinyl collectors forum. We urge all users to do their due diligence before buying anything. The term newbie refers to a person who is new to collecting Funko POP Vinyls or any other Funko products. Why does my cart redirect to Amazon when I try to order from popvinyl.net? Popvinyl.net represents Funko distributors from all over the world in bringing our customers the largest and most diverse Funko collection, by making this possible we are associated with Amazon for secure check out payments and the appropriate sourcing of products. Some of the products in my cart have changed prices when I get redirected to Amazon checkout, why does this happen? By bringing such a huge catalog to our customers we are synced with our distributors pricing, so with that in mind prices can fluctuate depending on our distributors changes, our system is then updated to those changes periodically. So if you do run into an item that is priced incorrectly it means that the item has not gone through the full update cycle. However if you have caught an iregular price change on popvinyl.net please email us and we will fix the problem. Exclusive POP Vinyls are basically a limited run of a certain type of POP Vinyl which corresponds to an event or shop for promotional purposes. Most exclusive POPs are usually different from the regular runs, this can be seen with the use of metallic paint, Glow in the dark features, variant colour schemes and added or subtracted items to the POP itself. The the go-to way of telling if a POP is an exclusive or not can be made out on the box itself, there is always a sticker on the clear plastic cover of the box which will tell you if the POP is in fact an exclusive or not. Exclusive: see the SDCC sticker on the box and the green paint on the side of the Alien POP? Regular: The regular is just plain with no sticker on the box and no green paint on the side. Exclusive POP vinyls are usually collectable, rare and are hard to get, so there is a high aftermarket price on most exclusive Funko POP’s. The best way to avoid high aftermarket prices is to attend the Con Events and Toy Conventions that Funko are going to be attending and buy the exclusives when they are advertised through different retailers. Prototype POP Vinyls are exactly what they sound like, they are the pre-production modals of the soon-to-be factory runs. Prototypes look as they sound, most of them are not painted like the production modals and in most cases they are just plastic molds for the Funko artists to make reference to in the creation process. 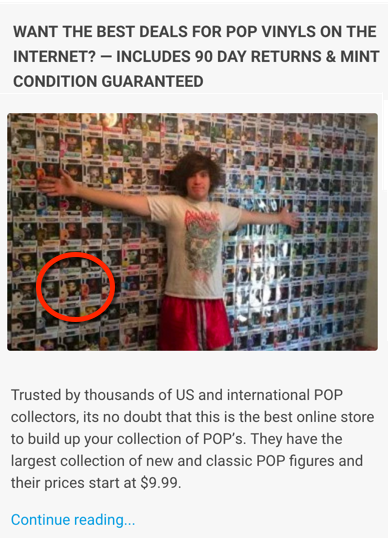 Proto POP’s are usually given away at Con events by Funkos CEO Brian, there is usually a raffle giveaway. Protos are considered by some to be highly collectable and rare and can be purchased from specialized collector stores that sell them. A chase piece is a special and rare piece which can feature different color schemes from the original POP’s and some of them have glow in the dark features and most of the time they come with a chrome base. This is heavily dependent if the retailer orders a master case of POP vinyls of the same figure from the wholesaler, which consist of 36 pieces per master case. The chances of finding a chase piece will be 1:36 if the retailer does purchase a master case. If the retailer only purchases the break off packs (cases which have been separated from the master batch) 6 pops per break off case there is a far less chance of getting a chase figure. Flocked Funko POP Vinyl figures feature Faux Fur making the the POP’s themselves feel fuzzy to touch. Flocked version POP Vinyls are almost always an exclusive of some sort. I am a business/company looking to set up sweep takes through popvinyl.net. Unfortunately we do not sponsor sweep takes or competitions made by third party websites. Popvinyl.net sees thousands of people per day and we are always open for contributors to try to better our and expand our user experience for popvinyl.net.